Jazz can be an intimidating environment for the uninitiated. Strange unfamiliar shapes tend to leap out at you from unexpected places, pull your hair and then disappear from whence they came. Certainly, they are mysterious and powerful, but they mean you no harm. The Arild Andersen Trio featuring Paolo Vinaccia (drums) and Tommy Smith (saxophone and Japanese flute) seemed mild-mannered enough, but it soon transpired that they have a touch of the wildness about them too. The upright bass is something of a beast itself but it is safe enough in the firm grasp of Andersen’s strong grip. 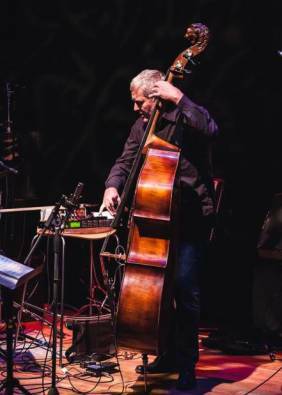 Nevertheless, the ECM veteran chose to open first with a tender touch, as if to placate the instrument and reassure the audience of the group’s intentions. Reperate began with a slow-bow cetaceous song played over a self-sampled loop. I once heard the naturalist Gerald Durrell describe the humpback whale as “An Underwater Cathedral”. I don’t think he was much into jazz, but I think he would have been fascinated to hear his description paraphrased by Arild Andersen.